Q.1 Draw the graphs for the following tables of values, with suitable scales on the axes. (i) How much distance did the car cover during the period 7.30 a.m. to 8 a.m? (ii) What was the time when the car had covered a distance of 100 km since it’s start? (ii) Use the graph to find the interest on Rs 2500 for a year. (iii) To get an interest of Rs 280 per year, how much money should be deposited? 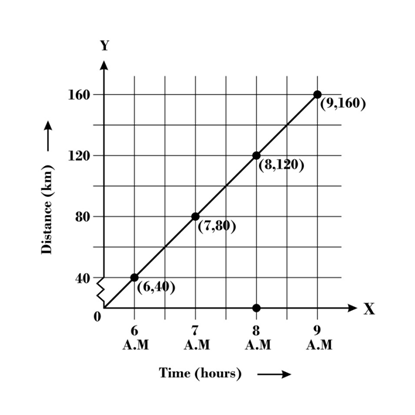 Here, x-axis represents the time and scale taken is 2 units = 1 hour, whereas y-axis represents distance (in km) and scale taken is 2 units = 40 km. (i) The car covered distance of 20 km during the period 7.30 a.m. to 8 a.m.
(ii) The time was 7.30 am when the car had covered a distance of 100 km since it’s start. 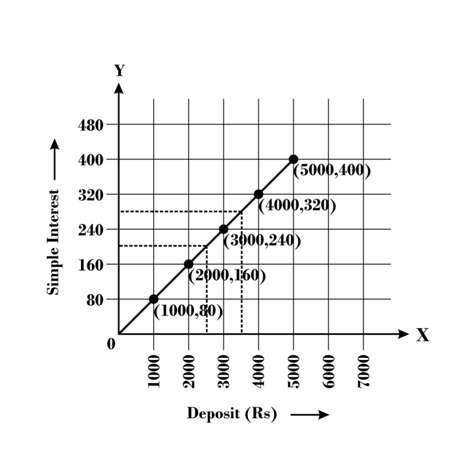 Here, x-axis represents the deposit (in Rs) and scale taken is 1 unit = Rs 1000, whereas y-axis represents simple interest (in Rs) and scale taken is 1 unit = Rs 80. (i) Yes, the graph do passes through the origin. (ii) From the graph, it can be seen that the interest on Rs 2500 for a year is Rs 200. (iii) Rs 3500 should be deposited to get an interest of Rs 280 per year. 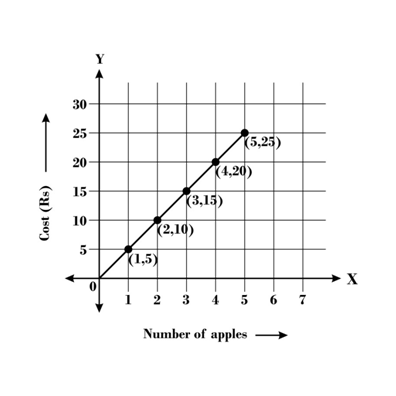 Q.2 Draw a graph for the following. 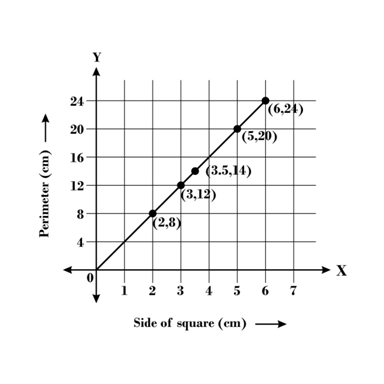 Here, x-axis represents the side of square (in cm) and scale taken is 1 unit = 1 cm, whereas y-axis represents perimeter (in cm) and scale taken is 1 unit = 4 cm. Yes, it is a linear graph. 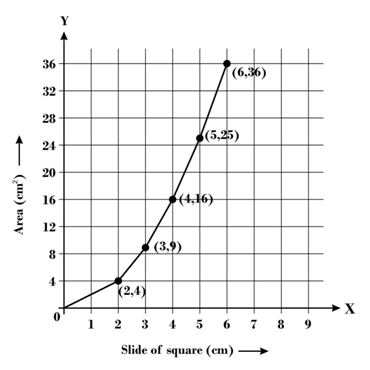 Here, x-axis represents the side of square (in cm) and scale taken is 1 unit = 1 cm, whereas y-axis represents area (in cm2) and scale taken is 1 unit = 4 cm2. No, it is not a linear graph. I am happy to see here your notes for students, thanks dronstudy.com.